• File formats: HTML, HTML, XML format. Fixed the reading of HTML tags and parsing of CSS styles. Styles inheritance. Borders Properties in css. Html elemets delimeters. Css units. Fixed the reading of HTML tags. Prefix parsing in CSS. CSS parser is available only in PRO version and presents a collection of declarations and selectors for styles of HTML tags, classes, ids etc. 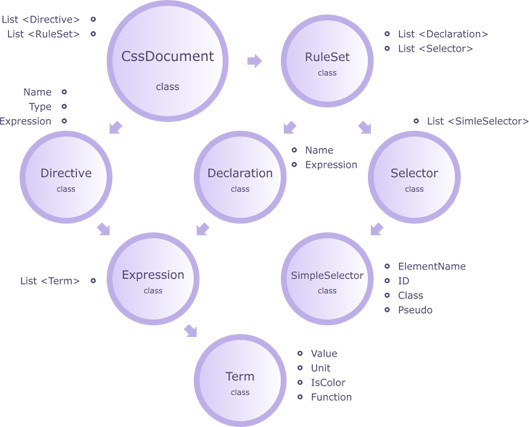 Getting declarations of specified class, identifier or html tag. Render the CSS stylesheet as an HTML document. Html Parser .NET is designed and developed to provide with convenient object model and easy to use API. Consider the CSS stylesheet and code snippets that help to parse it. The Css Parser allows to extract all elements of CSS style sheet. 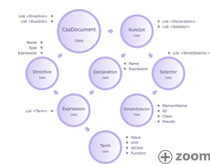 The table below demonstrates the main collections and properties of Css Document that is available a programmer to use. Creating and saving CSS files.